Although slightly smaller and less popular than its counterpart in Wieliczka, the salt mine in Bochnia offers equally beautiful and interesting attractions to visitors. The Bochnia salt mine is the oldest place where salt was mined on Polish territory, and at the same time Europe’s oldest industrial facility that has operated without interruption from the mid-13th century. Although slightly smaller and less popular than its counterpart in Wieliczka, the Bochnia Salt Mine offers equally beautiful and interesting attractions to visitors. Former pits and corridors, salt chambers, chapels hewn from rock salt, salt sculptures, and mining tools and machines are the constituents of this surprising underground city. Tourists walk the trail on foot, although they are welcome to cover parts by train, boat or sliding down a 140-metre (460 ft) slide that connects two levels of the mine. 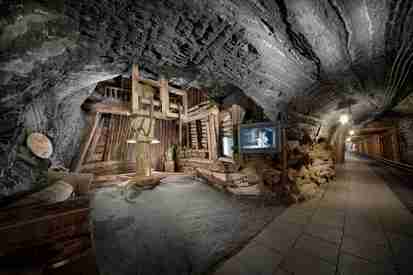 A special attraction of the Bochnia Salt Mine is a multimedia exhibition, which lets tourists become familiar with the history of salt mining, the hardships of miners’ labour, and the history of Poland. In 2013, the mine was inscribed on the UNESCO World Heritage List. Visits only in groups with a guide. During summer holidays (26.06. – 31.08.) additional opening hours and underground ferry crossing (14 PLN).